For the district, see Freising (district). 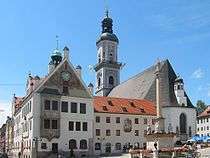 Freising is a town in Bavaria, Germany, and capital of the Freising district, with a total population of 45,227. The city is located north of Munich at the Isar river, near the Munich International Airport. Anyone taking off or landing at Munich airport can see the city to the north with its two hills, the cathedral hill with the bishop's castle and the Freising cathedral and Weihenstephan Hill with the oldest working brewery in the world. It's also the first recorded place of a European tornado. The above and other scripts from that time can be found in the "Bayerische Staatsbibliothek" (Bavarian State Library) in Munich today. Even though archaeological finds show that the area was settled in the Bronze Age, no proof has been found yet to suggest a continuous settlement until the 8th century Frigisinga. Saint Corbinian settled at a shrine that already existed at Freising in 724. He was the forerunner of the diocese of Freising, established after his death by Saint Boniface. According to his Vita by Bishop Arbeo he ordered a bear to carry his luggage over the Alps after it had killed his packhorse. The saddled bear is still the symbol of the city, displayed in the coat of arms. 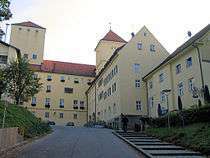 Though the seat of the diocese was moved to Munich in 1821, including the elevation to an arch-diocese, Freising has remained the seat of diocese administration until today. 764-783 Bishop Arbeo founded a library and scriptorium at the abbey. The settlement started to become a religious center. The mortal remains of Pope Alexander I are said to have been transferred to Freising in 834. 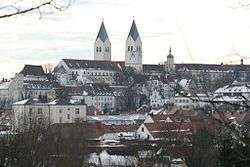 In 996 Freising received city rights from Emperor Otto III. However, after the "(...) destruction of the episcopal bridge, custom houses, mint, and salt works near Oberföhring by Duke Henry the Lion, who transferred the custom houses and bridge site to the upper part of Oberföhring, placing them in the village of Munich on the Isar" (Lins, Catholic Encyclopedia, 1913) in 1158, Freising started to lose its economic significance. In 1159 the romanesque cathedral was constructed (with a notable animal column in the crypt). In the secularization of 1803, the Roman Catholic Church lost most of its properties and authority over the city. Otto of Freising (1112–1158), bishop. The Bavarian General and War Minister Benignus Ritter von Safferling (1825–1895) was born in Freising. Karl Lederer (1898-1977), 1933 to 1942 mayor of Freising. Alexx Wesselsky (born 1968), musician, lead vocalist of NDH-band Eisbrecher. ↑ "Fortschreibung des Bevölkerungsstandes". Bayerisches Landesamt für Statistik und Datenverarbeitung (in German). June 2016. 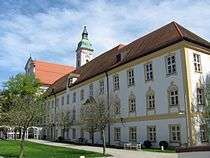 Wikimedia Commons has media related to Freising.